Xiaomi is set to release a successor to the Redmi Pro which was released last year, and it's called the Redmi Pro 2. 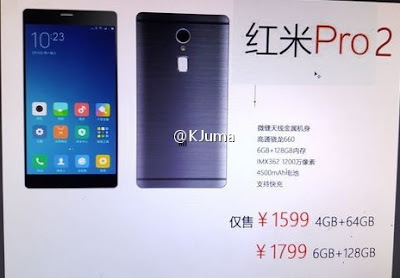 Although Xiaomi has not officially announced the phone yet, some of its specs has already leaked online. According to rumoured Specifications, the Phone is expected to feature a 5.5 -inch AMOLED display with a resolution of 1080 x 1920 pixels. It's also expected to come in two different memory variants which are 4/64GB and 6/128GB. Below is the Redmi Pro 2 specifications and price.